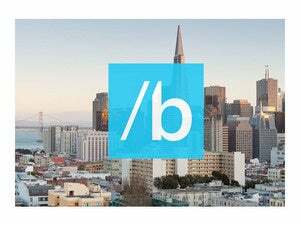 Even though its big annual Build conference doesn’t kick off until next week, Microsoft dropped Windows 10 Technical Preview build 10061 late Wednesday night. Unlike the last Technical Preview release—which merely added the Project Spartan browser—this one is positively stuffed with tweaks, changes and news apps. Curious, but loath to install pre-release software on your PC? Live vicariously. I’ve spent the night poking and prodding at Windows 10 build 10061. Read on for screenshots and impressions of all the new changes, and don’t forget to check out PCWorld’s guides to the best new Windows 10 features to try first and the top Windows 10 tips and tricks to get a deeper feel for the operating system. 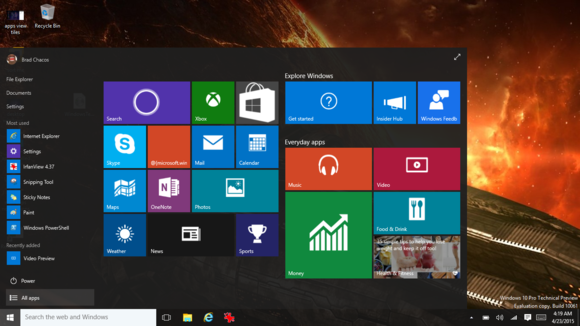 The very first thing you notice upon booting build 10061 is that Windows 10’s Start menu has been tweaked yet again. It’s been widened, from one “fat column” of apps to two, lending it a feel closer to Windows 8’s Start screen. Don’t like it? Fear not: Build 10061 also restores a previous option to resize the Start menu to smaller—or larger—dimensions. 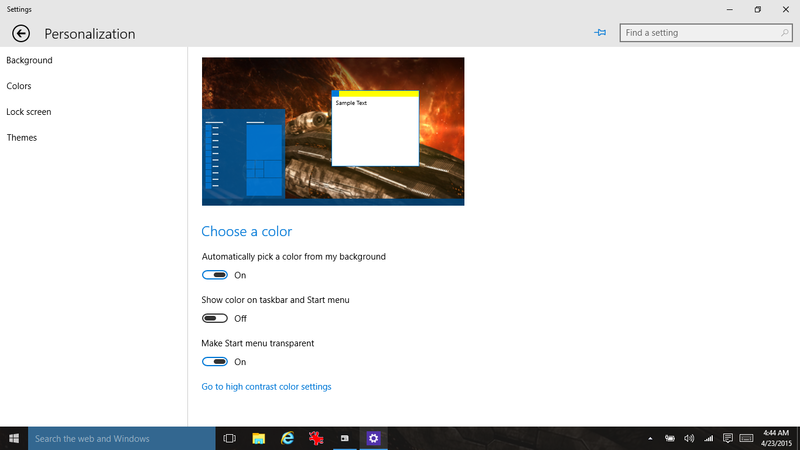 Note that the Power button was moved from the upper-right corner of the Start menu to the lower-left corner. It’s a subtle tweak, but an appreciated one for desktop users. Let’s hope it sticks! This build also adds a black system theme that travels across the Start menu, taskbar, and Action Center. 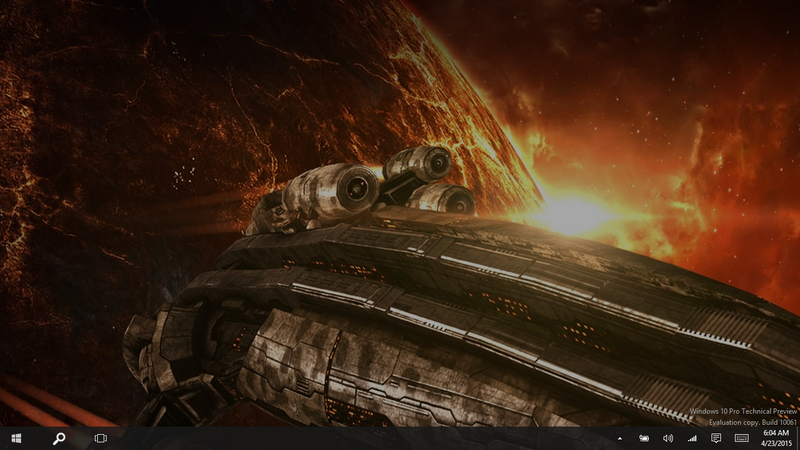 The Start Menu and taskbar also gained some transparency, showing a bit of the screen behind them. It’s a nice touch, and the transparency effect is opaque enough that your background doesn’t interfere with actually navigating the Start menu and taskbar. The fleshed-out personalization options in Windows 10 build 10061. Again, don’t worry if you don’t like it: The Personalization section of the Settings app has been fleshed out in this build. (It was pretty sparse in the last one.) If you head to it you’ll find options to enable or disable the new aesthetic tweaks in the Colors section. Once you move beyond the cosmetic tweaks you’ll find build 10061’s biggest additions: overhauled apps galore. Windows 10 build 10061’s revamped Mail app. 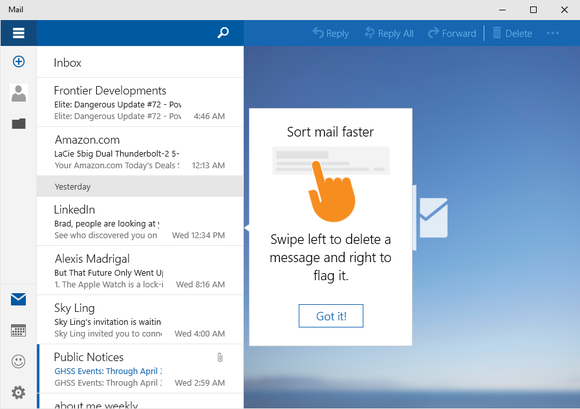 Most notable are the new Mail and Calendar apps, which first appeared in the leaked 10051 build that never officially made it to Windows Insiders. The Mail app introduces a three-pane design, with the ability to add a custom image background to the preview pane when no messages are selected. If you have a touchscreen, you can also swipe left to delete messages or swipe right to flag them, just like in the recently released Outlook mobile apps. Windows 10 build 10061’s new Mail app has a much more robust authoring experience, including the ability to insert tables. Really. You can see it here in the upper-right corner if you click to enlarge the image. Email authoring has been tweaked to more closely resemble Microsoft’s Word, with much more robust formatting options and—get this—the ability to insert tables directly into outgoing emails. 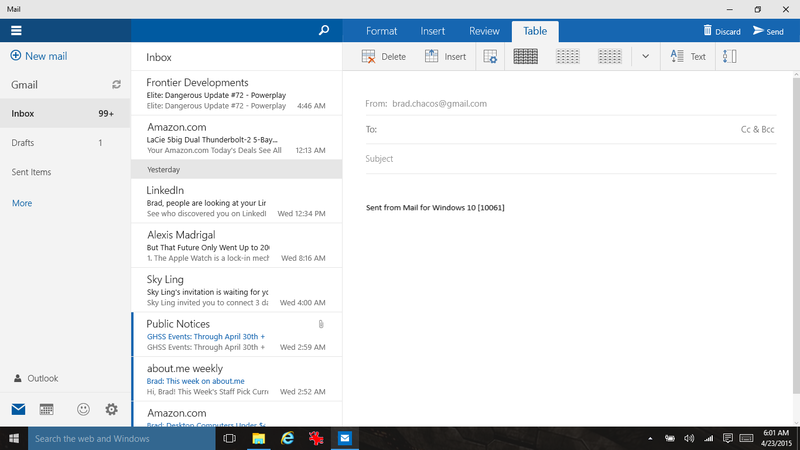 The new app also includes POP email support, a feature oh-so-sorely lacking in Windows 8. Hallelujah. The Calendar app, on the other hand, boasts significantly more color and contrast than the bland monstrosity known as the Windows 8 Calendar app. It also packs a left-hand pane with a small monthly view and checkboxes to quickly select which of your individual calendars are being displayed. 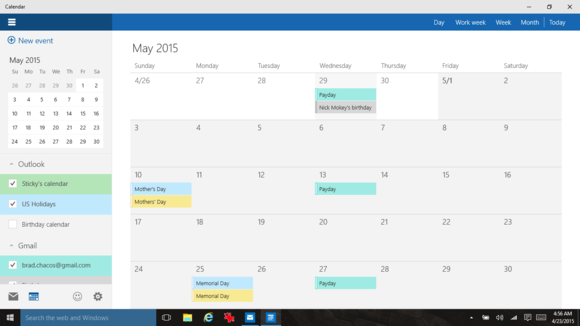 The new Calendar app in Windows 10 is a vast improvement over Windows 8’s dumbed-down gray mess. Both represent significant improvements over their Windows 8 counterparts, but perhaps the most vital changes to Windows 10’s new Mail and Calendar apps occur under the hood. While the Windows 8 apps were pokey at best—like virtually all Windows apps—the Windows 10 versions are fast and responsive, feeling like true desktop apps. Microsoft showered some love on the Xbox app as well, after introducing a new Xbox Avatars app in the Windows Store earlier this week. The changes are mostly subtle. 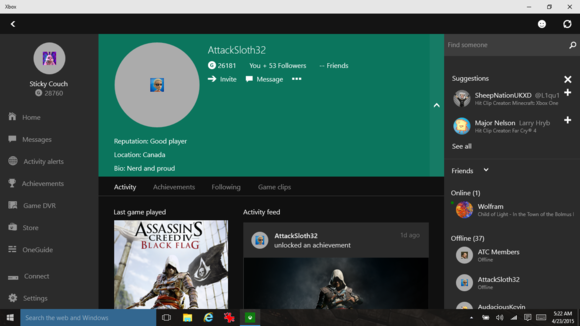 The Xbox app’s tile is now a Live tile in the Start menu, flaunting your gamerpic, messages you’ve received, and more. You can also check out other gamers’ reputations and bios by selecting the More Info option on their profile page. If you have an Xbox One (I don’t) the app will now show the apps you’ve most recently used on the console. If you’re testing the new Xbox One tuner, the Windows 10 app supports live TV streaming straight from your console to your PC, as well as picture-in-picture support. That AttackSloth32, he’s a swell guy. Just look at that reputation! The Xbox One is getting updates of its own to play more nicely with Windows 10, including support for Miracast wireless display mirroring. Microsoft’s Larry Hyrb says the new Windows 10 build also introduces the highly anticipated Game DVR function for PC games, which will let you save video highlights from any PC game, as well the ability to take screenshots of any game using Win + Alt + PrtScrn. Alas, the work laptop on which I’ve installed Windows 10 has no games. But forget the Xbox app. 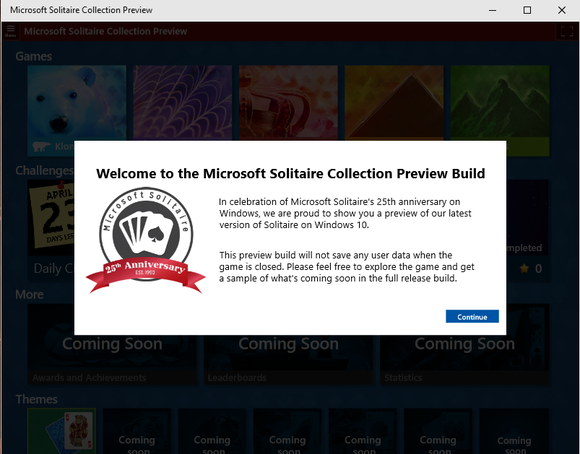 Here’s the real big gaming deal: Windows 10 build 10061 brings Solitaire back to Windows, as first noticed by Steve Troughton-Smith. Windows 8 banished the old standby, casting Solitaire and the other previously preloaded games (like Minesweeper) into the Windows Store as optional downloads. Windows 10 re-embraces Solitaire—though you won’t find it in the Start menu, nor the All Apps screen. Put Cortana to work searching for “Solitaire,” however, and it’ll pop up lickity-split. 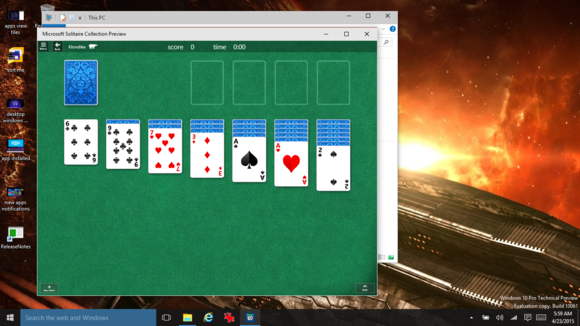 Solitaire returns in Windows 10 build 10061. Oh, and a warning for Solitaire purists: It’s the new-look Solitaire Windows app that comes preloaded in Windows 10, not the simple desktop application of old. Interestingly, Windows 10 build 10061 includes a new “Contact Support” app that points you toward resolutions if you run into trouble. You can arrange to chat online with Microsoft agents or (theoretically) schedule a support call from right within the app—which even displays the current wait time for your callback. 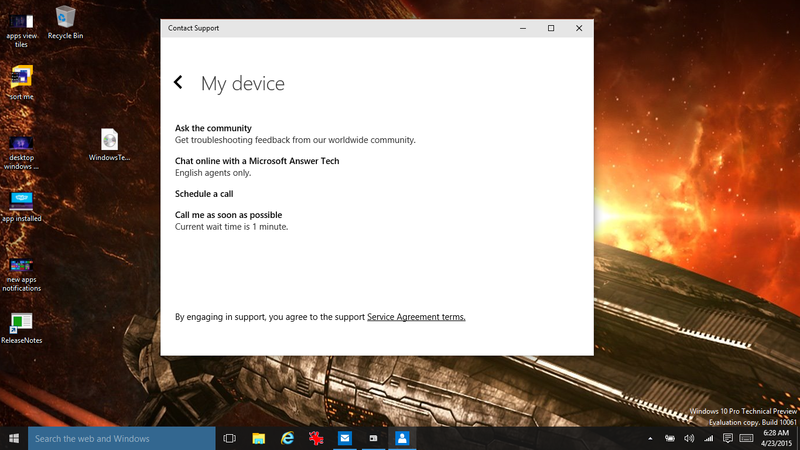 Windows 10 build 10061’s new Contact Support app. Currently, actually trying to schedule a call results in an error. It’ll be a nifty feature in the final build, though. Windows 10’s News app also receives a fresh coat of paint in build 10061. It’s a more dense design than its Window 8 counterpart, ditching its predecessor’s full-screen “main story” splash and cramming more stories onto the screen by ditching text descriptions in favor of a grid of images with headlines. There’s also a menu row across the top of the screen to jump from topic to topic. 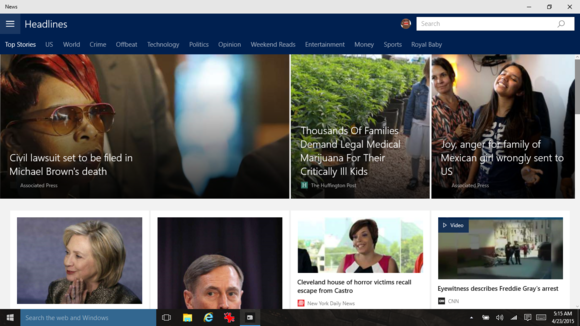 Windows 10 build 10061’s revamped News app. All in all, it’s a vast improvement over the ho-hum Windows 8 News app—one that introduces a more appealing aesthetic while simultaneously improving the navigation experience for touch and keyboard-and-mouse users alike. Finally, the Alarms & Clocks app has been redone with a white design, replacing the previous dark theme. Windows 10 build 10061 also includes a new-look calendar and clock interface when you click on the time and date in the taskbar’s system tray. 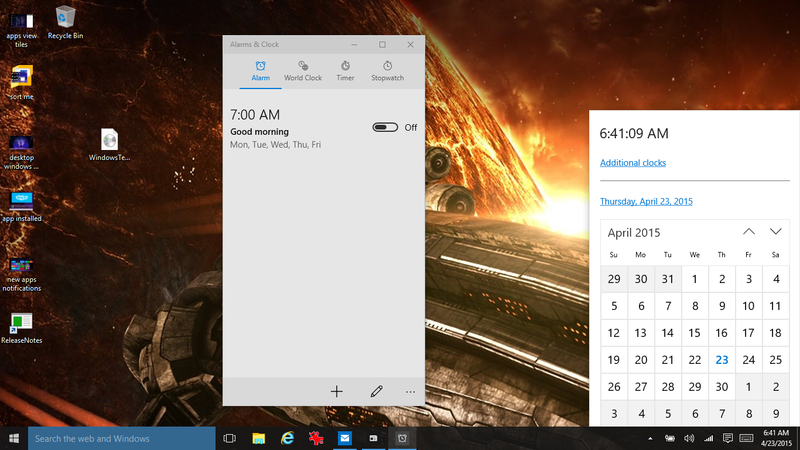 The overhauled Alarms & Clocks app and date/time interface in Windows 10 build 10061. Microsoft also tweaked Continuum, its solution for swapping between desktop-centric and touch-friendly interfaces. Windows 10 build 10061’s Tablet Mode is spartan indeed. Activating Tablet Mode (which you can do in the Action Center) strips all apps off your screen, leaving only icons for Task View, the Start screen, and Cortana/search in your taskbar. Those icons are more spread out in Windows 10 build 10061, which is nice for fat-fingered folks like myself. Even open and pinned apps disappear from the taskbar to “reduce clutter and simplify the experience,” though you can disable that by firing up the Settings app, searching for Tablet Mode, then toggling “Hide app icons on the taskbar when in Tablet Mode” to off. 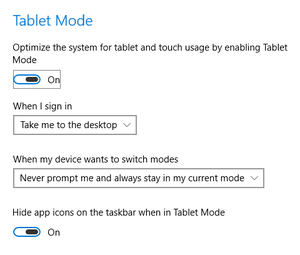 Windows 10 build 10061’s Tablet Mode settings options. 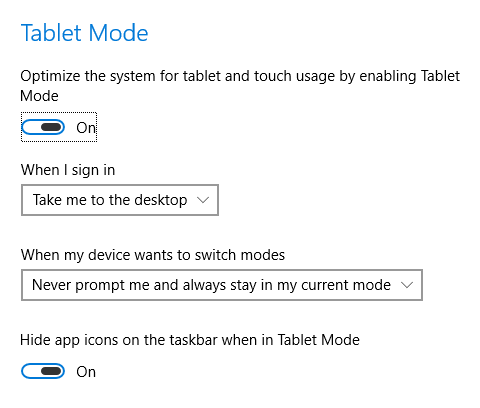 That same Tablet Mode settings screen also now contains an option to boot directly into Tablet Mode, rather than the desktop (though the latter is still the default). You can select your default interface from the “When I sign on” drop-down menu. Speaking of interface tweaks, Microsoft’s also slightly refined the look of its Task View interface, which allows you to jump among your various virtual desktops. The new build strips away all desktop clutter to focus solely on your virtual desktops and their open apps. 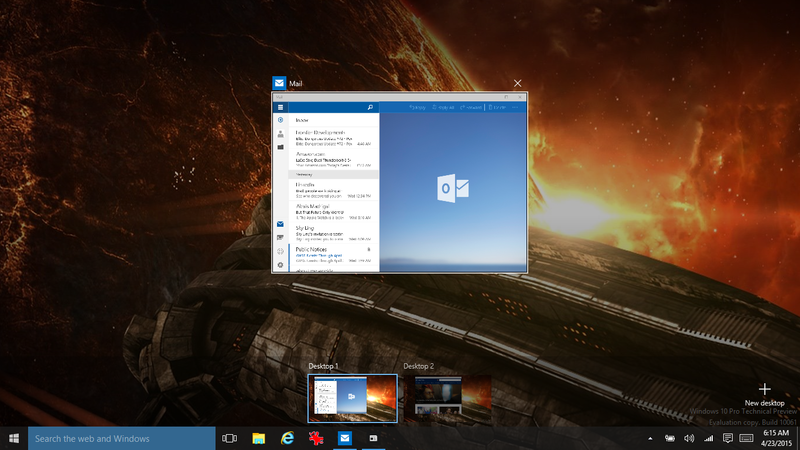 And if you really enjoy virtual desktops, Windows 10 now supports an unlimited number of them. Huzzah? The sparse Task View interface of Windows 10 build 10061. This is pre-release software, so Windows 10 build 10061 still has some rough edges. One cuts particularly sharp: Traditional desktop apps flat-out won’t open when you click them in the Start menu. That crippling flaw aside, Windows 10 build 10061 is easily my favorite Technical Preview build thus far. It’s been far less buggy than past Preview builds, and the whole picture’s really starting to coalesce into a smart, satisfying experience that successfully blends Microsoft’s Modern-era ideas with the traditional desktop interface that users love for damn fine reason. 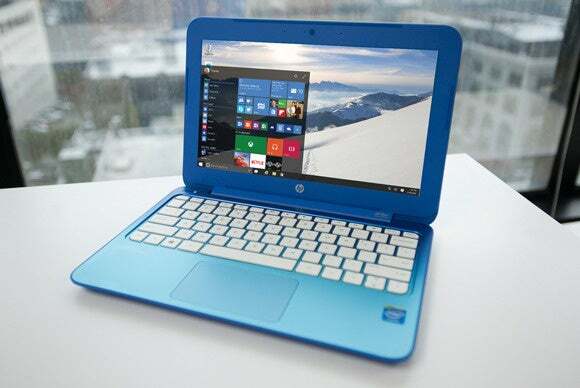 In other words, Windows 10 is shaping up into the experience that Windows 8 should have been. We’ll likely hear more about Windows 10 during Microsoft’s Build conference next week, especially considering that the operating system is slated to launch this summer—the end of July, if AMD’s CEO is to be believed.